Once upon a time, people paid for wireless internet access in public places. 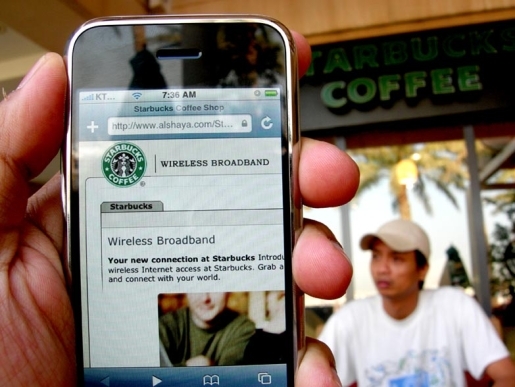 First and foremost among the WiFi offering joints was Starbucks, who has been offering WiFi to its customers for years. All they had to do was pick up a Starbucks card, enter the code, and they got two hours of WiFi service. Well, not anymore; starting on July 1, WiFi will be free in all Starbucks. Not only is the WiFi free, Starbucks customers will also be getting free access to paid content from sources like the New York Times and Wall Street Journal. Honestly, it was only a matter of time before they caved in. Pretty much every other coffee shop, be it local or chain, has free Wifi except Starbucks. WiFi is also widely available in bars, as well. Whenever I go anywhere, there’s always a sign touting “free Wifi!” Starbucks was a relic from the last generation of Internet access. It’s free now; time to get with the program, Starbucks.